A fast-paced action-packed, heart pumping team-based shooter MMO this free to play game offers bloody combat in detailed maps conducted in teams of up to 8 players over a variety of different game modes. Dizzel is a fun shooter MMO that requires teamwork, strategy and skill to be victorious in battle and work your way up the ranks of the leaderboard. Dizzel is a classic shooter MMO where players require great skill and reflexes to survive the brutal fast-paced battles, with quick movement, deadly attacks and near instant respawns the battles in game are a frenzy as players rush to dominate their opponents with up to 8 v 8 players per team, they must complete mission objectives and claim victory. 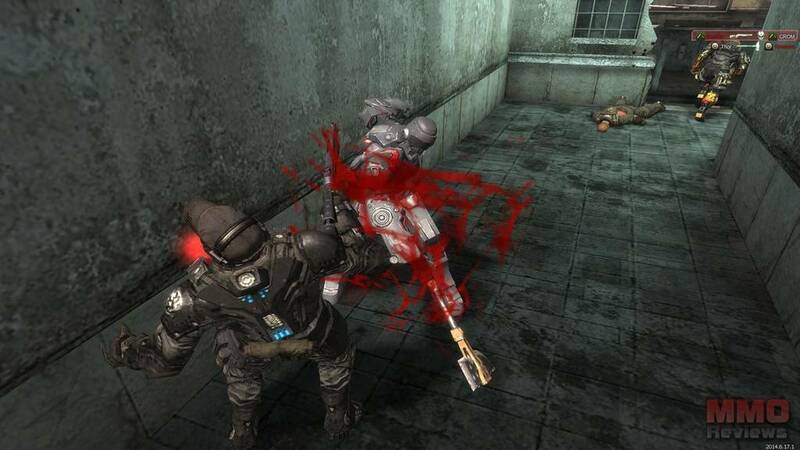 Using long ranged weaponry, grenades and deadly up close melee weapons the games’ deadly play style is reflected by the gruesome bloody animations and graphics as blood splashes across the arena. Players have the ability to perform fatalities, brutal and stylish executions that finish off enemies before players are able to get to them and revive them, full of chest stomping goodness. As the bullets are flying it is important to take Cover, players are able to hide behind part of the environments to take cover, either popping out to take precision shots or firing blindly in a hail of bullets. There is a variety of game modes that players can choose from, able to join rooms created by other players or set up their own, there are a number of different features and options changing everything from game length’s to required kills for victory. Maps range in size, shape and style, everything from small Eastern bazaars to large abandoned Ruined Cities, Underground Facilities, to known locations such as Venice and St Sirkeci Train Station (Istanbul). Maps provide various routes to navigate, hidden areas and vantage points as well as plenty of cover to take advantage of the games mechanics. Many maps are geared towards a specific Game Mode, but most are available through the Team Deathmatch games. Through acquiring in game currency players are able to equip themselves with a variety of weapons and items, everything from rifles and shotguns to deadly melee weapons and grenades, players choice of customised loadout will determine their play style and in game options. Gear can either be hired temporarily so that players can try out items before spending the Premium Currency to add a weapon to their inventory as a permanent fixture. In the game players can also have a number of skills that they trigger as they charge up their meter through kills and assists, these can be purchased in the in game shop and range from increased damage, increased defences and the ability to one-hit kill players with rifle shots. The game is a competitive MMO where players compete against each other for rank and position, based off the player with the most EXP, best K/D ratio or the number of Wins they have under their belt. Players are able to create their own clan or apply to one that has already been made, together players can work for ranked position as they compete against each other in Clan Wars to show who the best Clan in the game is.